Today I ground up the last of my Kalamazoo Coffee Company peaberry that was part of the Portage Library bag stuffed full of gifts which was waiting for me on my bed when I arrived in Michigan exactly four weeks ago, reminding me that I really ought to write a blog post about my wonderful visit there before it becomes ancient history! When Olivia Pennebaker, the Teen Services Librarian at the Portage District Library in Michigan, got in touch with me a year ago about using Code Name Verity as their 2018 CommuniTEEN Read title, I couldn't have been more delighted. I'd just come back from a week discussing Rose Under Fire as Central Pennsylvania's chosen One Book, One Community read, and I'd pretty much decided that there is nothing more satisfying in life than talking about your own story with a bunch of excited people who have read your book and want to bombard you with questions. The annual Portage CommuniTEEN Read program is relatively new; I was only their third speaker. Essentially, it is a collaboration between the Portage District Library, Portage Central and Portage Northern High Schools, and Bookbug Bookstore in Kalamazoo. 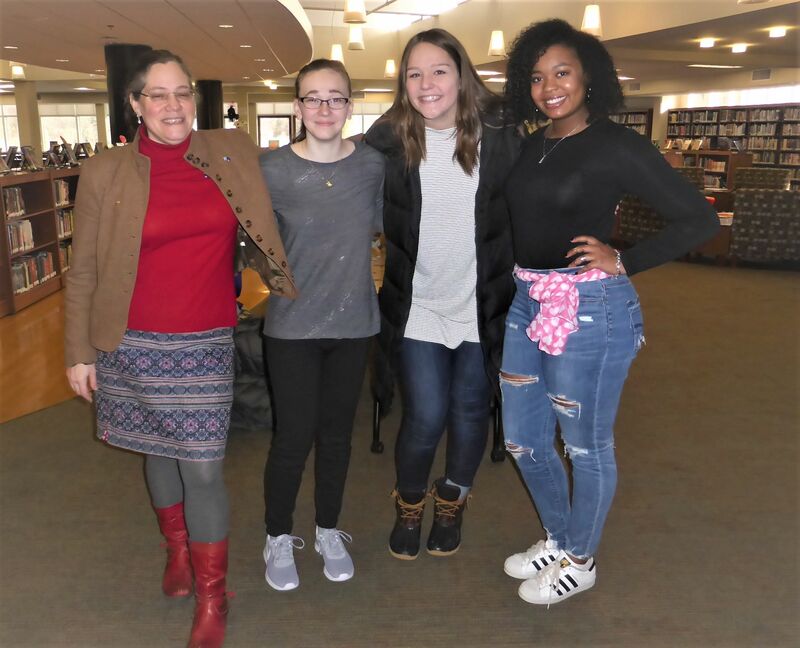 The high school students read a chosen title together, discuss it with each other and with their families, and finally get to meet and talk to the author. 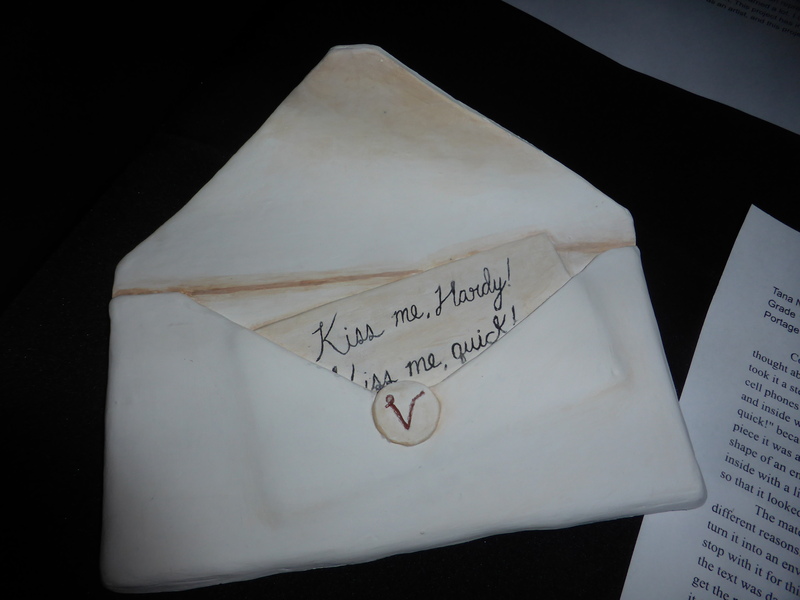 Some readers went a lot further than this and used Code Name Verity in their written English projects, or to inspire sculpted artwork, and even as a theme for their sewing and knitting clubs (World War II inspired skirts and Queenie's scarf!). I got to engage with the students and community even before I got to Michigan, with a Skype call to a packed auditorium at Portage Central High School, in addition to phone and email interviews with students and a local radio station (those interviews are online here and here and here). But the real fun started when, for three days in March 2018, I got to visit Portage in person. My visit began with another interview, this time with Midwest Electric, one of the CommuniTEEN sponsors, for their company newsletter. We met up at the Kalamazoo Air Zoo and I seem to recall talking a lot about flying bombs - put it down to jet lag! At last I got to meet Olivia Pennebaker and her colleagues Sara Brown and Jeanna Walker, the Media Specialists at Portage Central and Portage Northern, and when the interview was over we all went together for a tour of the Air Zoo - the fantastic air museum that had agreed to let us host a public event related to Code Name Verity in the same week. 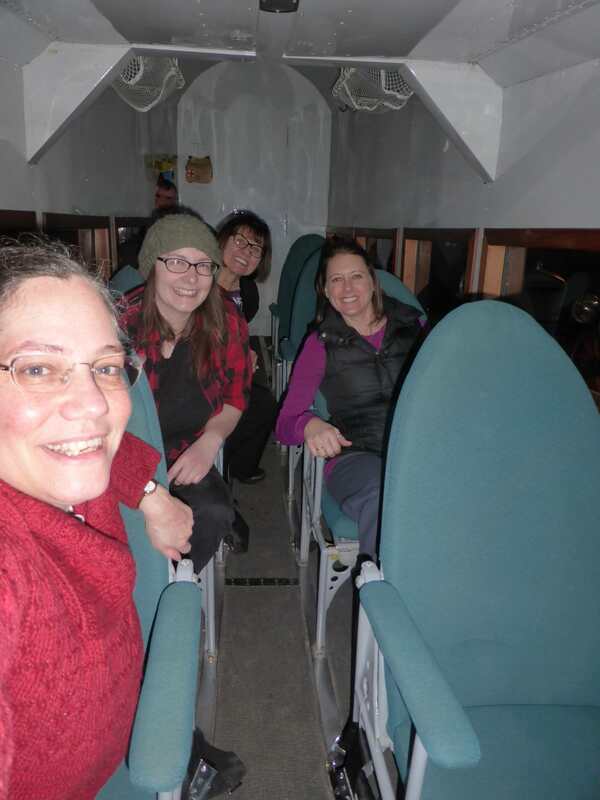 Ready for take-off in a Ford Trimotor. With Olivia Pennebaker, Jeanna Walker, and Sara Brown. Afterward I got to meet the CommuniTEEN Committee in a very pleasant and informal meal at OneWell, a local brewpub. Considering that it was pretty much snowing half-heartedly the whole time I was in Michigan, the warmth of my welcome by everyone I met definitely made up for the weather. Part of a welcome banner from Portage Northern High School! Wednesday, March 14, was the day of the nationwide school walkout in memory of the Parkland shooting victims and in support of stricter gun control across the USA. I live in Europe and write freelance - what are the chances of me working as an educator in an American school on this day of all days? I was so happy and proud to be able to join the Portage Northern students in their own rally and was moved to tears by their eloquent speeches. We went straight from that walkout into the auditorium for my first CommuniTEEN presentation, and I had to start off by telling the students how inspiring they all were - and apologizing for dumping this burden on their generation. No, when I was in high school, I did not have to hide in the toilets because I was scared I'd be shot at a pep rally. WHY SHOULD THEY???? Then we talked about Code Name Verity and fighting Nazis. And how fiction and history are SO. VERY. RELEVANT to our own lives. Each of my school visits consisted of a speech to an auditorium full of kids, and then a more intimate discussion with a smaller group. At Portage Northern, this was an International Baccalaureate English class who'd read Code Name Verity instead of Anna Karenina! I was EXTREMELY FLATTERED to be considered a worthy substitute for Tolstoy. The evening event at the Kalamazoo Air Zoo was wonderful. 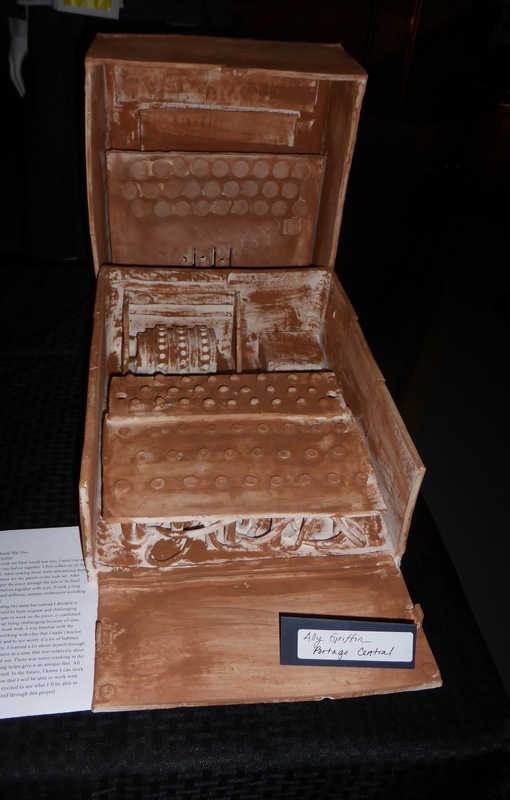 There was an audience of close to 200 people, a really mixed group of ages including teens and seniors - as well as a former commercial pilot and a Penn graduate who'd studied with MacEdward Leach (Penn folklorists take note!). There were even a few kids who'd already heard me speak earlier that day, coming back for more! I had to stand in the shadow of a Lockheed SR-71 Blackbird (which can fly from London to New York in an hour and a half) to give my talk, which was kind of cool. Bookbug was there selling Code Name Verity and - appropriately - Taking Aim, a collection of stories about teens and guns edited by Michael Cart, in which I have a short story. And there was A.MAZ.ING. 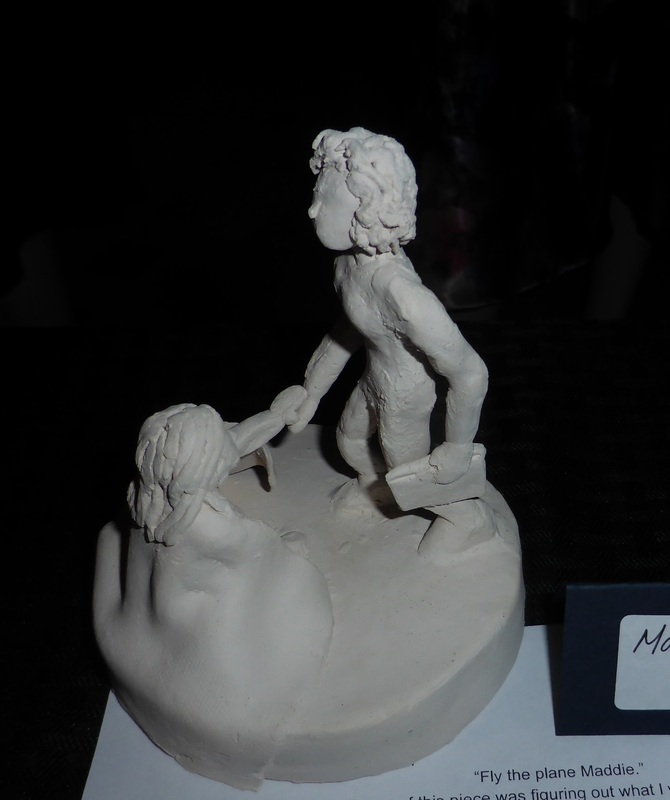 artwork on display by the students who'd done their sculpting projects on Code Name Verity. On Thursday, I visited Portage Central. Here, I did another interview, this time with Karen Woodworth for K-12 360, a program reporting on local schools. (You can see my part in it here.) After being made welcome and presenting to the students there - in large and small groups - the visit finished with a prolonged, relaxed and happy lunch in the staffroom with organizers, educators, and librarians. I really hated for the visit to come to an end! But the good news was that now I got to spend the weekend in Washington DC with family and with my friend Amanda, to whom Code Name Verity is dedicated. 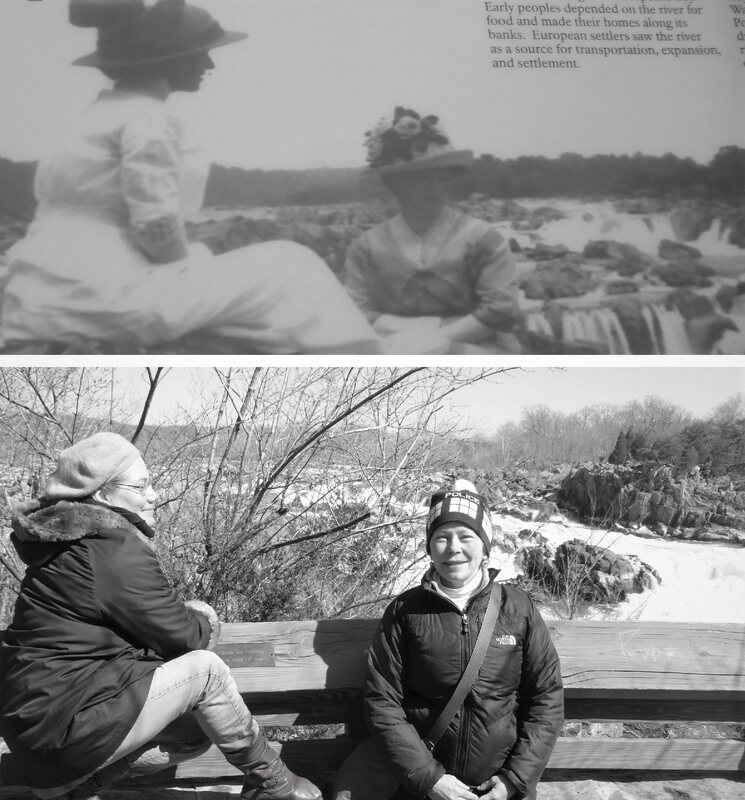 We visited the Smithsonian Air and Space Museum and went to Great Falls, where we attempted to recreate this picture we found on the information board at the scenic outlook. Notwithstanding our photographer didn't quite get what we were trying to do and that the season is all wrong, at least we are all wearing cool hats. As I said in one of those interviews - I am so lucky to be able to have a job that I love.